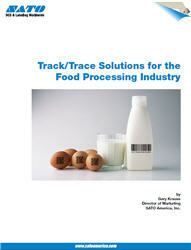 Track/Trace Solutions For The Food Processing Industry - SATO America, Inc.
By Gary Krause Director of Marketing, SATO America, Inc. The news of late makes it clear; there is need for food processing traceability and a growing demand by the public and government to make this happen. The decision making of traceability solutions falls onto the individual corporation and the stakeholders they serve. Consumer markets and the US government demand accountability in the wholesomeness of product and there’s growing concern by state government for regulations on producers to validate their raw product processes using information technology, track and trace accountability. Years and years of paper trail detail produces an overwhelming amount of data for one producer to keep track of, yet alone the man hours associated with keeping the data captured organized and useable. When coupled with the number of manufacturers who “touch” a single ingredient used to manufacturer the final product, the task of gathering this information is daunting to say the least.